* The original Omega Railmaster of 1957 was a simple, practical, yet elegant watch designed for railway staff or anyone who worked close to electrical fields. Today, that spirit of innovation has been carried over into an updated model which enhances the Railmaster's capabilities yet again. 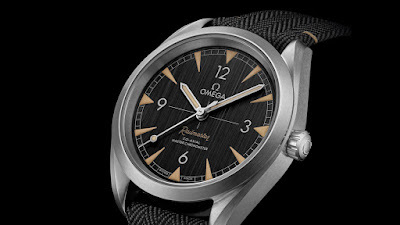 * The watch was driven by the Omega Co-axial Master Chronometer Calibre 8806. Certified at the industry's highest standard by the Swiss Federal Institute of Metrology (METAS) and able to withstand magnetism of 15.000 gauss, this Railmaster model recalls the superb anti-magnetic qualities of its predecessor.